At the time of European settlement, white-tailed deer in Minnesota existed throughout the wooded river valleys and woodlands of central and southern Minnesota. In northern Minnesota, where the forest habitat was much different than it is today, deer were absent or rare. Moose and woodland caribou were the most abundant members of the deer family. As European settlement cleared forests for lumber and agriculture, deer habitat quality improved through the creation of new openings. Increased agricultural land conversion eventually reduced habitat quality in many areas and, along with market and subsistence hunting, resulted in deer population declines. By the 1880s, deer were rare in many parts of Minnesota. Natural resource management, regulated hunting and the white-tailed deer's ability to adapt have enabled the population to grow well beyond its pre-settlement range and numbers. General description: The whitetail is a large brown or gray mammal that has a white tail it lifts and waves when alarmed and running. 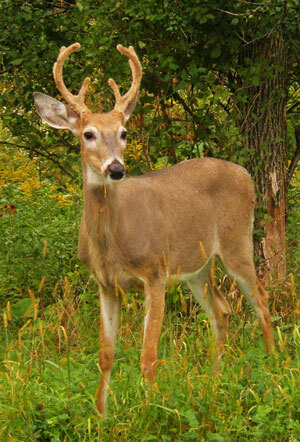 Length: Whitetails are 4 to 6 feet long, have a 6- to 12-inch tail and stand 2 to 3 feet tall. Weight: Males weigh 100 to 300 pounds; females weigh 85 to130 pounds. Color: Reddish brown in summer and grayish brown in winter. Sounds: Snorts, grunts and bleats. White-tailed deer mate from November to early December. Their young (often two fawns, weighing eight pounds each) are born seven months later. 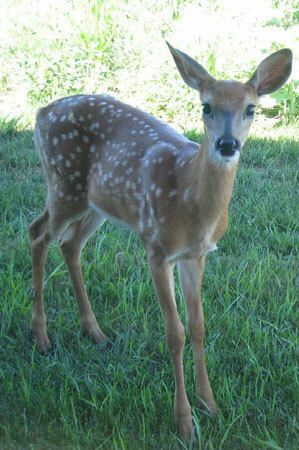 Fawns have white spots that disappear after three to four months. They nurse for the first several months then remain with their mother for the next one to two years. White-tailed deer eat many foods, such as acorns, corn, soybeans, mushrooms, grasses, tree leaves, buds, twigs and bark, wild grapes, apples and assorted shrubs. Wolves, coyotes, bears, and bobcats hunt and eat whitetails. 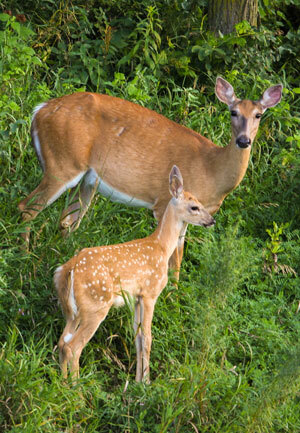 White-tailed deer live in prairies, forests, swamps, wood lots and agricultural fields. They are common in both suburban and rural areas. Sometimes they are a traffic hazard. During harsh winters, deer may also become a nuisance to farmers by eating hay or corn that is stored for livestock. When alarmed, whitetails fan their ears and raise their tails, as though raising a white flag. This is a signal to other deer that danger is nearby.